Please see the Readme at my GitHub repository – https://github.com/chrisl8/ArloBot as it is usually kept more up to date. Then come back here and follow the instructions! While a lot of the fun stuff with the robot happens on the Ubuntu laptop with ROS, the motor control and sensor polling is all done on a Parallax Propeller microcontroller. I like to think of the laptop as the cerebral cortex of the robot’s brain and the Propeller board as the Cerebellum. The code for the Propeller is all written in C. I have set it up so that it will refuse to run into things even if ROS tells it to, and if it gets much too close to an object it will actually back away. This way it is safe to experiment with ROS without worrying too much about crashing into walls. You can also gently “push” the robot out of your way by just getting close to it and it will move away if it can. (Yes, you can “herd” your robot!) Obviously you still need to be careful, especially if you tell it to drive around extremely fast, because you can drive into a wall faster than the sensors are able to register it. Here are the steps to get the C code that I use with my Arlobot ROS package onto your robot using the Ubuntu laptop you should have connected to it. Follow all of these steps from your Ubuntu laptop. Because the laptop must be connected to the Propeller board via USB at all times for ROS to operate, it is natural to install SimpleIDE on the laptop and use it to update the code on the Propeller board when needed. This isn’t a store bought toy, this is a learning project, so if you have never done anything at all with a Propeller board, I highly recommend insist that you go to http://learn.parallax.com/propellerc and follow some of the turtorials to get to know the Propeller chip, the Activity Board, SimpleIDE and Propeller C.
This will give you a good background to understand what is going on. You can do this with just the Activity Board and your Windows computer, and then come back here later to make it all work with your Ubuntu laptop. Without doing at least a few of the tutorials you will be following my instructions in the dark. They may get you to your destination, but it will be frustrating. And then you will have to reboot to make this work. I am very sad about this, but it seems we can limp along by using copies of old code releases. In the example below I show using ‘wget’ to pull the latest version of SimpleIDE from a web archive service (since Parallax has abandoned it) and installing the package on Ubuntu. If it is not already done, plug your Propeller board into your Ubuntu laptop with the USB cable. 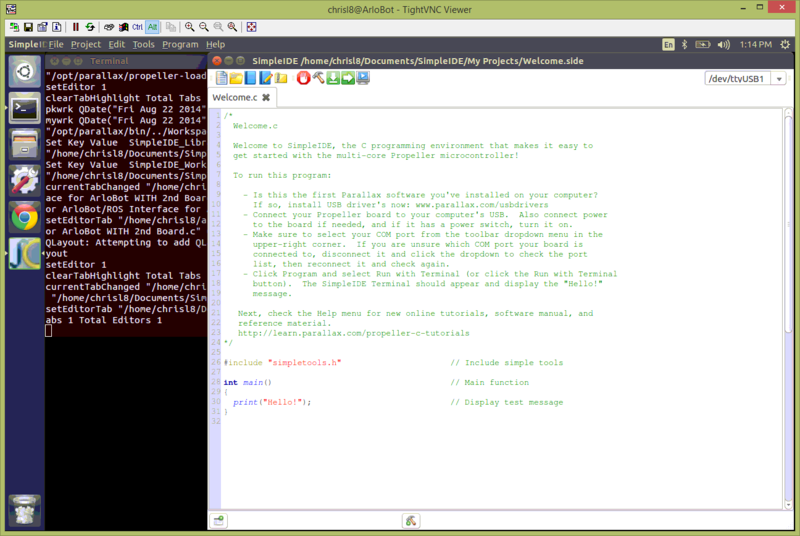 The first time SimpleIDE runs it will create a folder with required libraries in it. Please let it use the default location. Notice that I am using VNC to do this from the comfort of my desktop machine. Make sure you see “/dev/ttyUSB” at the top right. It will probably be USB0, but if you have more than one board it could be another one. You should get a blue terminal window with the text “Hello!” in it, or whatever the simple test program was set up to send. This proves that your SimpleIDE is installed and that your Propeller board is properly connected. You can press “OK” on the Terminal window to close it and close SimpleIDE. For HB-25: The extra code from Parallax to work with the Arlo platform is already in my arlobot repository, you just need to copy it into your SimpleIDE folder structure. # Do NOT run these lines unless you have the OLD HB-25 motor controllers! Click on the little hammer icon to just Build the code without loading it to the board. If it says, “Building … done.” in green highlight then everything is good! If it failed to build start trouble shooting or send me a note. This will walk you through testing your Arlo connections and basic code to operate the the Arlo platform from the Propeller Board. Even if you are using my code to run it, it will help you to deal with problems if you understand how the basics work. DHB-10: Calibration is not required for the DHB-10. There are steps on the site listed above (under Learning) for adjusting parameters, but calibration isn’t required. HB-25 Controllers: ONLY DO THIS IF YOU HAVE THE OLD HB-25 CONTROLLERS! Otherwise skip to Step 7. This step is a little complicated, so follow closely. but I’ve put it together here in one list of instructions. The point of this is that you load special code into the board that, when powered on, causes the board to run a series of tests on the motors and then store the data into a special place in EEPROM. Once this is done you should never have to do it again, because no other program ever writes to this memory. Note that this code is specially written by Parallax so that once it completes it will not run again. If you want to do the calibration again you will have to load the code into EEPROM again. Otherwise, once it finishes once, resetting the board will not cause it to run again. 1. The instructions say to put your robot in a clear area to do this. I have also just put it up on “blocks” or a sturdy box so that the wheels can run freely without moving the robot. I’m not sure which, if either, is better. 2. Run SimpleIDE if it isn’t already running. 4. Turn OFF the Motor switch. 5. Set the Activity Board switch to position 1. 7. When the program is finished loading, the P26 and P27 lights will turn on. When they come on, slide Activity Board switch to 0. 10. Turn system power on but leave motor power off. 11. Press and release Activity Board’s reset button. 12. Wait a couple seconds. 13. Turn on motor power and wait for it to try to do something. 14. Press and release Activity Board’s reset again after the HB25s are convinced they are getting servo signals. 15. Move back to give it room to spin in place and slowly roam while it gathers wheel speed data. Both wheels should turn at some point. First it will spin in one direction, then the other. If one of the motors never comes on, you need to start over, because something went wrong. 16. Leave it alone until the P26 and P27 lights turn off (about 2 minutes). After that, calibration is complete and you can turn the power off again. although obviously some things, like the server adjustments, do not apply. 7. Edit the Propeller C Code for Arlobot to fit your setup. Now at the top there is an entire section of “#define” statements. You need to comment out some for items you don’t have, and you need to adjust the numbers after others to indicate things like how many PING sensors you have and where they are located. 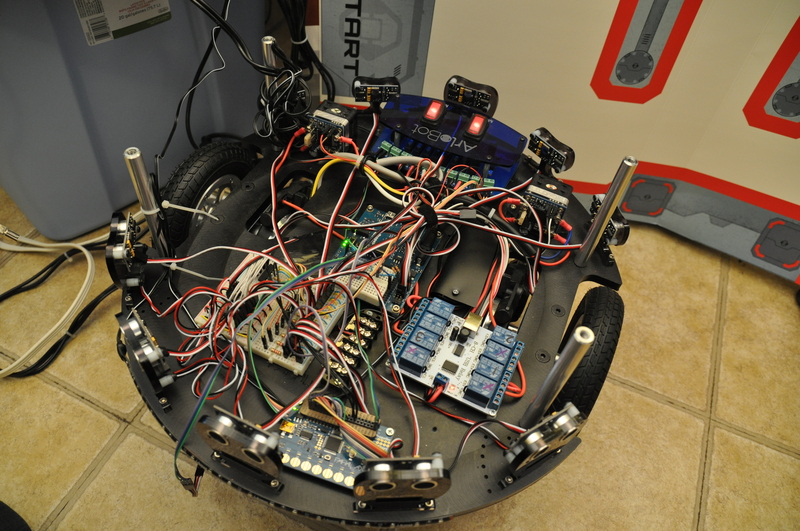 By doing this, the code will be compiled to only include the parts you need and with setting specific to your robot. 8. Load Propeller C Code for Arlobot on to Propeller board. The way the Propeller controller works is that if you load a program into “EEPROM” it will stay there and start any time the board is reset or power cycled. This means once the code is there you don’t have to mess with it again unless you want to change something. If you get any of the “#define” settings wrong the first time, this could be one reason to reload it. Plug the USB cable back into the Activity Board and Ubuntu Laptop. The board should load the code and reset. Please see the file direct2PropSerialTestLines.txt for more information about how to test the Propeller code directly. There is also some information in README.md, but direct2PropSerialTestLines.txt is kept most up to date. Test all output, and attempt sending twist commands directly. Until this works, do not expect ROS to work. Remember, this is open source, so feel free to fix mistakes and make changes to the code and tell me about them! Better yet, fork the code and send me pull requests! Next read over README.md, or try scripts from ~/catkin_ws/src/ArloBot/scripts/ and anything else from ROS that you want to try! You can go to the ROS Turtlebot page and read about various functions it has and attempt to make them work with your robot. You may want to do this if you ONLY want the the Propeller Board to run from DC power and not the USB device. I had a few spare hours over the holiday season so far to do some cleanup and add a few goodies I picked up from Parallax during their sales. I’ll write more about my additions soon. Someone pointed out that they were not sure what the terms in my domain name meant. While it is probably very fun and safe to Google either term, I will explain both briefly here for reference. However I think Brian Greene explains it more elegantly in his book “The Fabric of the Cosmos” in his discussion of The Universe on a Brane. Ultimately “ekpyrotic” isn’t anything deep and mysterious, just a fun word with roots in science that sparks my imagination. Adams, Douglas (2010-09-29). The Ultimate Hitchhiker’s Guide to the Galaxy (p. 21). Random House, Inc.. Kindle Edition. This is a little random, and off of the usual topic, but it is nerd stuff, so I’m posting it here. Our electric company recently installed a “smart” meter that allows us to see our energy usage in fifteen minute increments on their web site. I find this fascinating and fun in itself. However, I also find the way it reveals daily life interesting. Last night our youngest woke us up in the middle of the night when she threw up. We had to get up, turn on lights, and use the vacuum cleaner (“shop vac”) to clean up. Can you tell when this happened? Most nights the energy usage is nearly flat during our entire night’s sleep. Obviously this shows our sleep patterns. Now add a “blip” on any night, and suddenly you can tell when something happened in our house. You can just imagine how data like this from thousands and millions of homes could show patterns of illness, and surely other events, around the country!